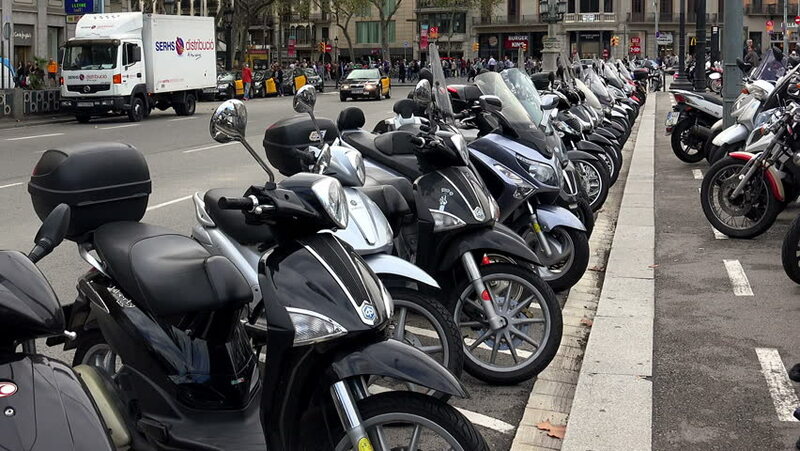 BARCELONA, SPAIN - SUMMER 2016: Parking for mopeds and motorcycles in the center of Barcelona. Mobeds, scooters, motorcycles. Spain. 4k00:0728 March 2017. Bangkok, Thailand. Presenter with BMW motorcycle at the 38th Bangkok International Auto Show at the Impact Center. 4k00:0828 March 2017. Bangkok, Thailand. Presenter with BMW motorcycle at the 38th Bangkok International Auto Show at the Impact Center. 4k00:0928 March 2017. Bangkok, Thailand. Presenter with BMW motorcycle at the 38th Bangkok International Auto Show at the Impact Center. 4k00:25GUILIN, CHINA - CIRCA NOVEMBER 2018 : ELECTRIC SCOOTER parked at the street.